I am beyond excited to be taking part in the One Room Challenge for the first time. I am a long time lurker but have never participated because the timing never worked. And I didn’t have a blog! But now I have a “sort of” blog so here we go…. 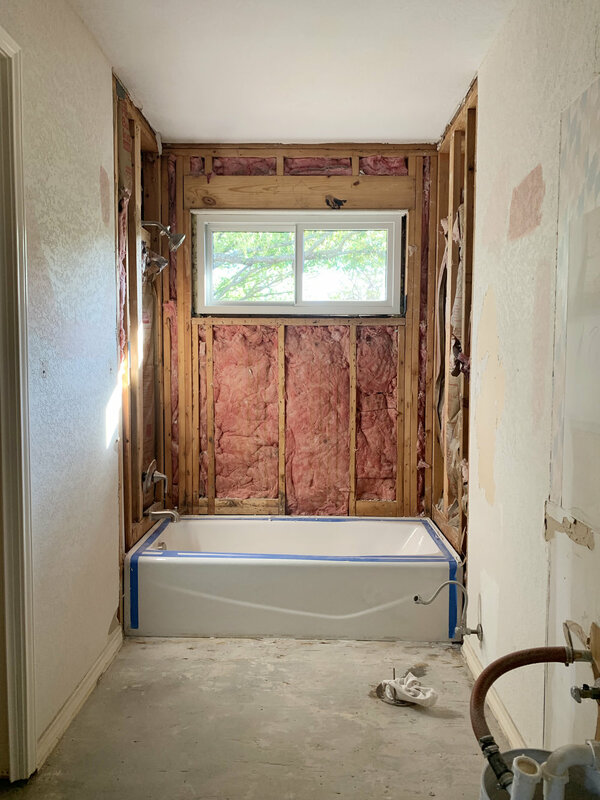 I’m renovating my daughter’s bathroom. This project is way overdue! 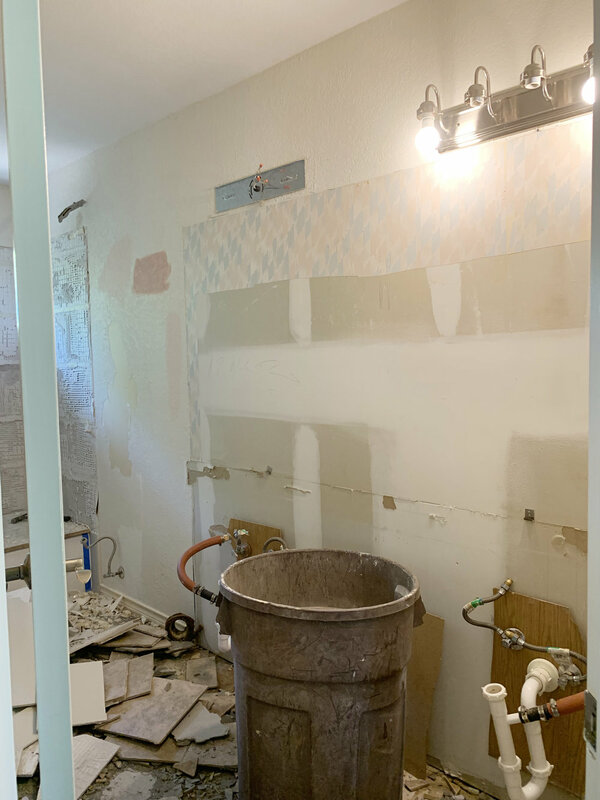 Behold the bathroom in its current state. Ugh. But before photos are supposed to be heinous right? That’s a lot of brown! Ok, so it’s not generally very interesting or appealing. But beyond aesthetics, we have a real problem that makes me dizzy. The floor is not level and slopes down toward the vanity side of the room. We’re told that this is not a structural problem. It may be house settling or possibly the house was just built this way. Sigh. Luckily this is something that can and will be fixed in the remodel. 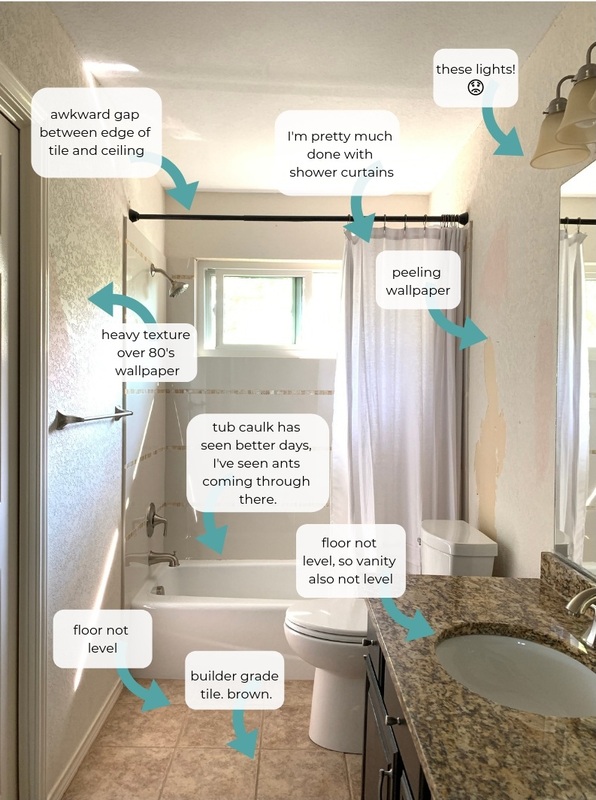 Above is a visual map of all of my grievances with this bathroom. Nothing surprising, we’re ripping it all out and starting from scratch. Another view of the before. You can see where I committed to this project by starting to peel off the textured- over wallpaper. We also tried a few paint swatches and decided against them. The medicine cabinet is going. 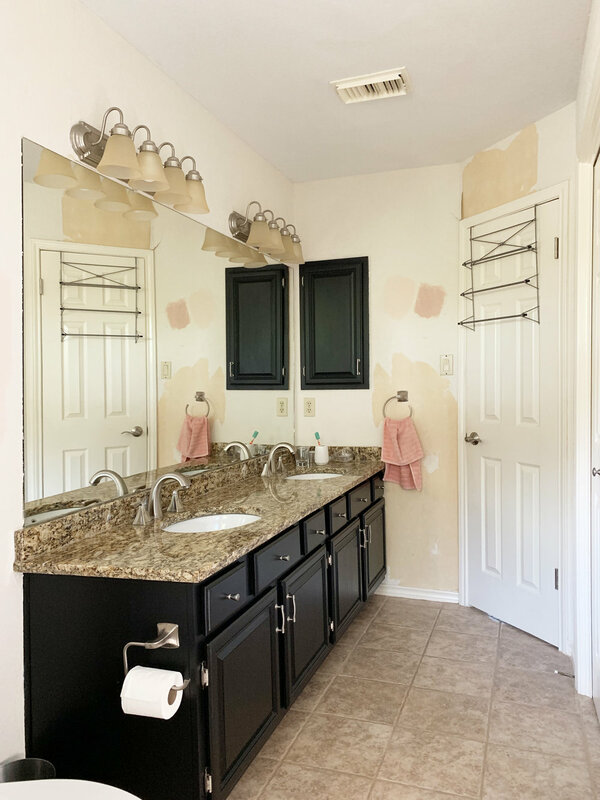 Flooring, vanity, frameless mirror, tile, all going. The only things staying are the tub and the toilet. Note to self, I need to plan more towel hanging space because that over the door hanger must go as well. The wall opposite the vanity has a large linen closet. It happens to be the ONLY LINEN CLOSET IN THE HOUSE. I realized this on the day we moved in, as I went around searching for additional linen storage that didn’t exist. The plan is to update the doors and trim. I’d also love to add an organization system to the inside of the closet because it is always crazy. I blame it on kids, but in reality it’s all of us. I mean, who put an empty fish tank in there? I know that an organized closet is probably pie in the sky for this house, but we can at least try. We’ll have to see what time and budget allow, since closet innards are not considered critical path as we start out. As I mentioned before, this is a kid’s bathroom. One of the reasons I could put this project off for seven years is because I don’t use it much! It also functions as a guest bathroom so I’d like a design that appeals to adults as well as a 10 year-old girl. pastels, but not pink. 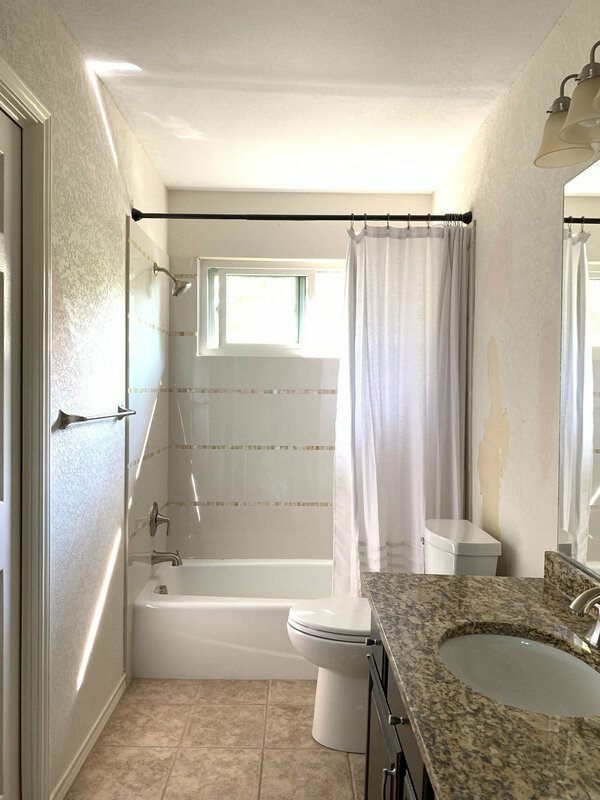 She did recommend pale peachy pink walls for this bathroom, though. Yes, the cognitive dissonance is already starting. 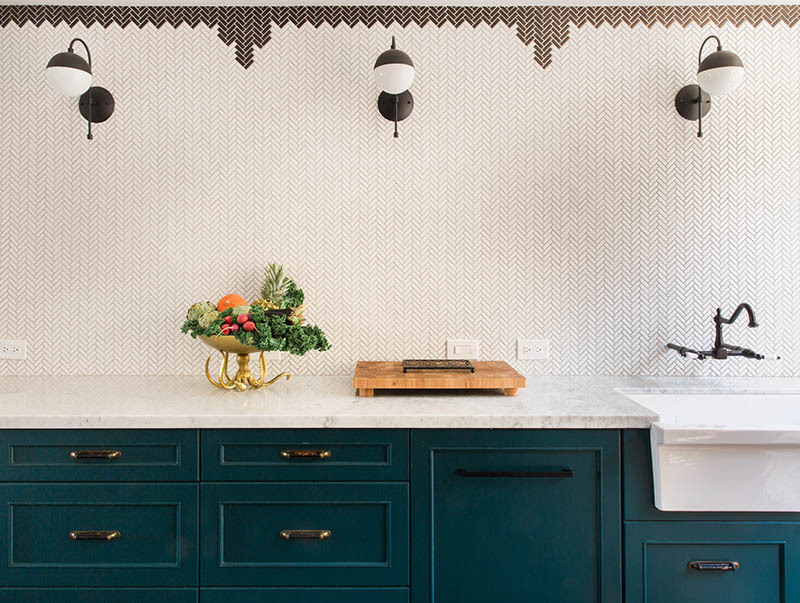 Blue vanity, pendant lighting, marble floors, herringbone shower walls, wallpaper, GOLD. I’ll leave it at that for now. My client is happy and there’s a little something (ok, a lot) to make me happy too. I hope you follow along next week when all the fun really begins. I’ll be updating my Instagram stories @k.laingdesign with extra project details. 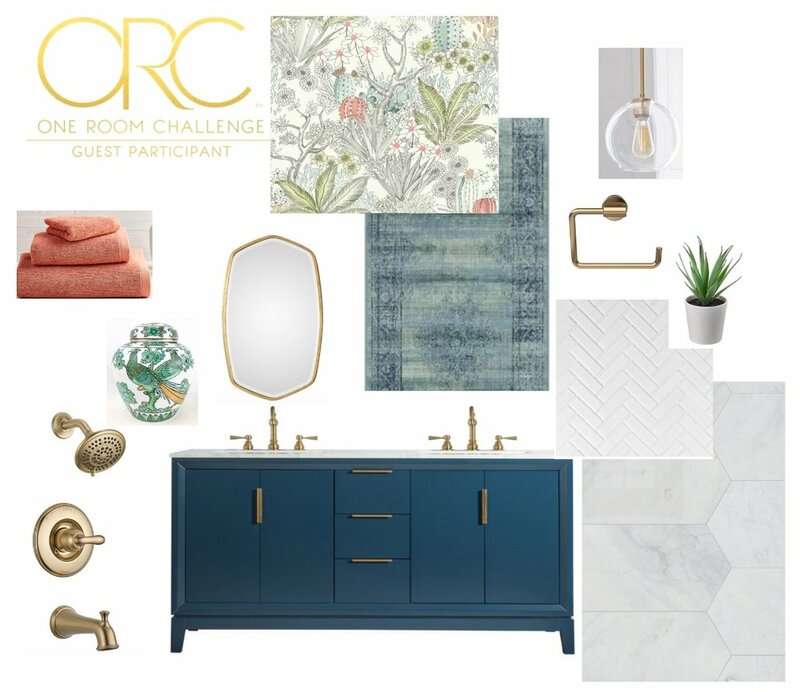 Now take some time to check out the other participants on the One Room Challenge blog.